Pulse HR - I'm having issues with my activity data. What should I do? Make sure that your Pulse HR appears in Devices in the Health Mate app. 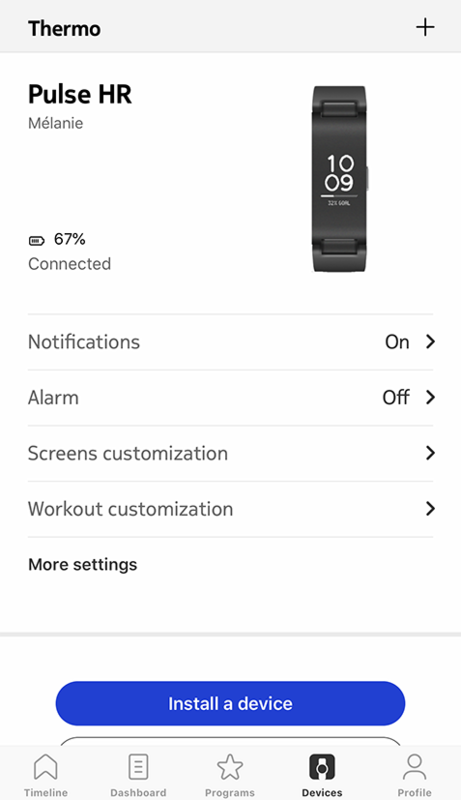 Select Devices in the Health Mate app and make sure that your Pulse HR is connected. If not, try to turn off Bluetooth on your mobile device and then turn it back on. You'll know that the connection with your Pulse HR has been established when you can access the Alarm or Notifications screens. Your data should then start syncing. You need to run for at least 2 minutes for your running to be detected. You need to run somewhat consistently. If you stop running every other minute, the algorithm won't be able to detect your activity. Note that running activities are based on your number of steps, your personal data (such as your height) and your pace. We do not use a GPS to track the run, and as such, can't guarantee the accuracy of the distance displayed. To accommodate most users, our algorithm works best with breaststroke and crawl. Also, swim detection has been calibrated in 25 meters and 50 meters-long pools. As such, your swim data may not be accurate if you swim in a smaller pool. If your swimming isn't detected even if you follow our recommendations, try wearing the wristband a bit tighter. Click here to see the list of activities detected by your Pulse HR. Note that adding activities manually is now possible. Click here to add activities with iOS. Click here to add activities with Android. Which activities are detected by Pulse HR?